Pickersgill has been providing quality care since 1802, and today the mission of our board continues in everything we do: to provide quality care at a reasonable price. 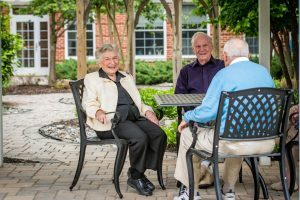 We combine a host of services and amenities with a social model of assisted living that improves our residents’ quality of life while keeping them independent longer. Here’s a look at what makes Pickersgill a sensible option for an ideal assisted living lifestyle in the Baltimore area. Jim went on to explain that while Pickersgill is a moderately sized community in terms of population, it’s still a small enough place where everyone can get to know each other. And getting to know your neighbors at Pickersgill is easy, because all the events on their full social calendar are open to everyone in the community, regardless of their level of care. Some of the more popular events at Pickersgill include a weekly happy hour sponsored by the board of directors, an expert-led writing group and a contemporary issues class that regularly attracts more than 50 residents. While Jim said that Pickersgill’s best asset is its residents, the community’s next best asset is its location. The location of Pickersgill itself, nestled in charming West Towson, presents a lovely suburban setting within close reach to shopping, top-rated hospitals, entertainment, universities and more. Beyond that, Pickersgill provides value through its nonprofit status. Every dollar that the community takes in goes directly back to improving the lives of its residents. For example, Pickersgill is getting ready to start a three-year, $6 million project to improve its activities spaces, nursing center, building corridors and more. In addition, just last year, Pickersgill undertook a $300,000 project that tripled the size of its rehabilitation center. Driven by its mission and with these projects as proof, Pickersgill sets itself apart by the amount of its funds that directly benefit its most important group – the residents. Whether you are searching for an assisted living community for yourself or for a loved one, an invaluable aspect of choosing Pickersgill is the peace of mind it provides for our residents and their families. Pickersgill is a place where we provide excellent care in a safe, social environment while always remaining on watch. Our organization is small enough that our staff gets to know the residents on a personal level, so they can provide an individualized level of service. As a resident’s child recently noted, altogether this leads to a great deal of peace of mind for everyone. Pickersgill provides assisted living at a value. Independent of our reasonable rates and high level of services provided, the priceless peace of mind, great place and powerful sense of community are all included. We invite you to get in touch to learn more. Simply click here, or call us at 410-825-7423 to schedule your personalized visit. ← Enjoy Our Beautiful Grounds & Get Outdoors this Fall!